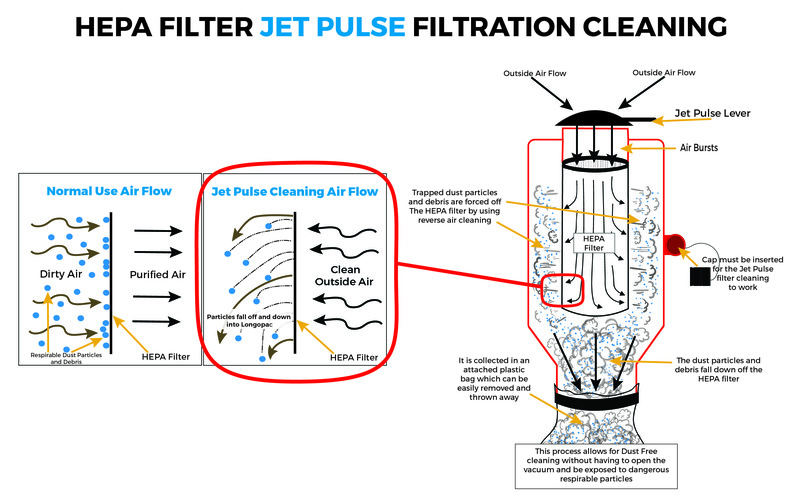 Jet Pulse filter cleaning works by forcing pulses of air in reverse through the filtered air stream. By doing so, you are able to easily and quickly dislodge all of the debris by expanding the filter media and disrupting dust and other particles that are trapped and stopped by the filter, and then blowing them off in the opposite direction. They are then collected safely into a plastic bag that can be removed and disposed of without the user ever being exposed to the debris, dust or other particles. The concept is pretty simple but incredibly important. Without Jet Pulse cleaning built into your Dust extractor system, you risk being exposed to dangerous respirable particles, including silica dust which causes Silicosis and many other illnesses and ailments. If you’re reading this from a rental house or dealer standpoint, and are looking to invest in a piece of equipment with jet pulse cleaning, it has many benefits for you as well. Not only are you able to offer equipment that complies with the new OSHA Regulation changes and other health and safety guidelines, but also know that your users will be protected from the various dangers that come along with the exposure of the toxic respirable particles. Additionally, having Jet Pulse filter cleaning built into the piece of equipment makes it easy for the user to continuously make sure that they are properly cleaning out the filter without any hassle. This will increase the life of the machine and ensure maximum efficiency and suction power, with less maintenance cost for you. This also contributes to user friendliness, making that piece of equipment more desirable to rent. After you finish cleaning the debris and the manometer gage is indicating that you’re losing suction power, you’ll want to detach the vacuum hose and insert the cap / or plug, that will be attached to the opening. Doing this builds up a significant amount of pressure. On the top of the piece of equipment, there is a Jet Pulse lever that you hold down, leaving the vacuum open for approximately 5 seconds: this allows for outside air to be let in through a small door that is opened by pressing down the lever, and blows the dust and debris off the filter. Then release and allow for the pressure to build up for another 5 seconds. Continue the previous two steps 5 times – hold down Jet Pulse lever (for 5 seconds) and releasing to allow build up (for 5 seconds). Once finished the previous step you can shut off the machine, or re-attach the vacuum hose and continue working. The dust and debris that was removed from the filter will then fall through a trap door at the base of the machine into an attached plastic bag – also known as a Longopac. Once the bag has reached approximately 50 – 60 Lbs (approximately 22 – 28 kg, 3.5 – 4.5 stone) you can securely tie it off and remove the bag. The bag of dust and debris can then be disposed of accordingly. You never have to open the Dust Extractor system during the Jet Pulse Cleaning process. Jet Pulse cleaning offers a simplistic, efficient and safe way of cleaning the filters inside of your dust extraction equipment. It eliminates the wasted time, mess and exposure to toxic respirable particles, that you would otherwise have to deal with without the Jet Pulse cleaning. If your piece of equipment doesn’t have this feature, we suggest making sure that you use other forms of safety equipment when cleaning the filter to avoid life threatening exposure.